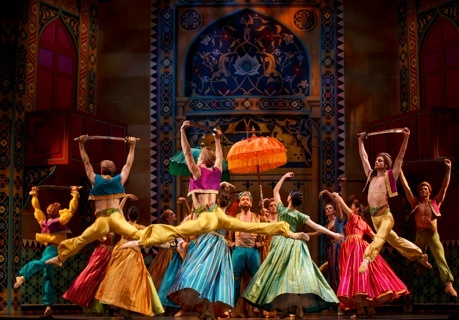 In 2008 Opera Atelier unveiled its new production of Mozart’s The Abduction from the Seraglio (Die Entführung aus dem Serail), the first staging of the work with period instruments. In the current revival of that production the Tafelmusik Baroque Orchestra shines again as do Gerard Gauci’s gorgeous sets inspired by Persian miniatures. This time, however, the cast is not quite as distinguished as it was last time and director Marshall Pynkoski’s emphasis on physical comedy has pushed subtler elements of the work aside. The 1782 opera was the most popular of Mozart’s lifetime. It also has the least complicated plot and least complex characters of any on his operas still frequently performed today. Belmonte (Lawrence Wiliford) strives to free his beloved Konstanze (Ambur Braid) and her British maid Blondchen (Carla Huhtanen), here called “Blondie” along with his servant Pedrillo (Adam Fisher), from the harem of the Pasha Selim (Curtis Sullivan) . All are guarded by the Pasha’s overseer Osmin (Gustav Andreassen). Wiliford, who sang Pedrillo in 2008, moves from servant to master, Huhtanen, Andreassen and Sullivan reprise their roles, while Braid and Luther are new to theirs. Mozart makes up for the lack of complexity in the characters by the complexity of the music they have to sing, including some of the most difficult arias he ever wrote. Wiliford’s tenor has gained in richness over time but he seems to be singing at the limit of his lung-power throughout. Braid, tosses off the coloratura showpiece “Martern aller Arten” with ease but she has the least clear diction both in singing German or in speaking the dialogue in English of the cast. Adam Fisher has a lively, acrobatic stage presence and speaks the dialogue well, but he, like Wiliford, needs more power to put his light tenor across. Gustav Andreassen has a bass as dark as a double espresso, but he emits some of his lowest notes with little resonance making them sound rather like faint rumbles than sung music. In fairness, Mozart gives Osmin the lowest notes demanded of any singer in opera, yet Andreassen seemed to have handled them with greater ease in 2008 than now. It is Carla Huhtanen of all the singers who is as bright, pert and impressive now as she was in 2008. She is the most at home on stage of any of the singing principals and displays the kind of effortlessness and accuracy in her delivery that one wishes the others commanded. Perhaps it is because Pynkoski is directing singers like Wiliford and Braid who are adept at comedy that Belmonte and Konstanze make a much stronger impression as comic figures than did Frédéric Antoun and Amanda Pabyan in 2008. This is not a development for the better. A lightweight plot such this benefits from variety and Mozart has built into the music a contrast between the serious noble couple of Belmonte and Konstanze and the comic lower-class couple of Pedrillo and Blondchen. Mozart takes up this structure again in the contrast of Tamino and Pamina versus Papageno and Papagena in The Magic Flute (1791), and, indeed, this contrast would survive into the 20th century as one of the basic building blocks of Viennese operetta. When both couples are comic the opera loses a major source of richness and variety that comes from seeing how different people respond in different ways to the same promises and threats. Pynkoski’s giving Konstanze modern plastic-framed reading glasses and encouraging her to mug and even smirk during “Martern aller Arten” reduces the nobility of her character, just as having Belmonte seem to cringe at the thought of climbing a ladder reduces his. Making both couples comic means that Curtis Sullivan as the speaking character Pasha Selim has to take whatever serious tone there is in the opera all by himself. The fact that Sullivan does such a find job in portraying the depth of Selim’s love for Konstanze and frustration at her rejection of him makes one wonder why Wiliford and Braid don’t portray depth of emotions of an equivalent level in song. One feature of Opera Atelier’s Abduction seldom encountered in other productions of the work is the inclusion of dance. Choreographer Jeannette Lajeunesse Zingg enhances every choral passage with spirited and imaginative dance and during “Martern aller Arten” cleverly integrates pincers, swords and whips into the dance to illustrate the “Martern” (“tortures”) that Konstanze faces. No one will complain that the opera ends with a reprise of Mozart’s famous overture with its use of “Turkish” instruments to give Zingg the chance to stage a triumphant extended dance finale to cap the action. As usual the Tafelmusik Baroque Orchestra under conductor David Fallis gives a rousing yet incisive account of the score, sometimes with surprisingly rapid tempi, but always characterized by its amazing precision and warm richness of tone. Audiences new to opera will be happy to see a comic opera that is actually laugh-out-loud funny and peopled with lithe, fit singers who in no way resemble the caricatures of two-ton opera singers of the past. Audiences familiar with the work, however, wish for more variety of characterization and expression to reflect more accurately the variety of Mozart’s score. Photo: (from top) Ambur Braid, Laurence Wiliford, Adam Fisher and Carla Huhtanen; Artists of Atelier Ballet. ©2013 Bruce Zinger.